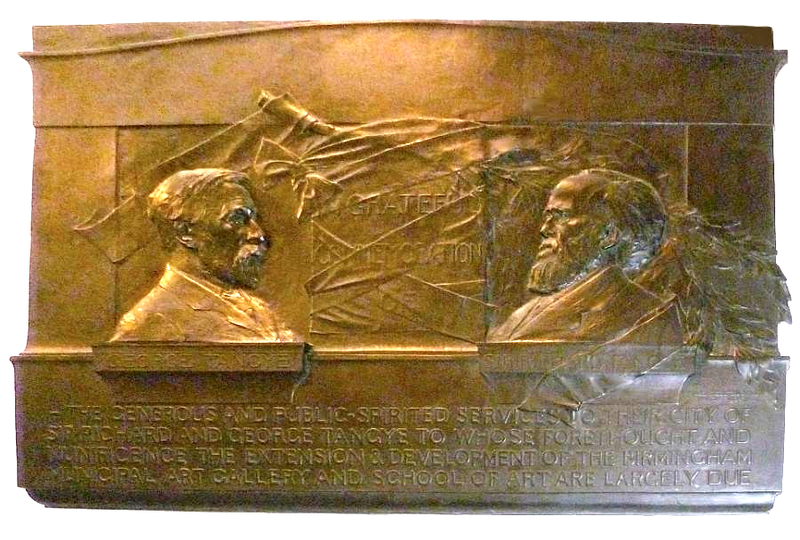 Commemorative Plaque for George and Sir Richard Tangye (1835-1920, and 1833-1906 respectively). William Robert Colton. Unveiled 1908. Bronze relief on marble (information on the gallery's label). By the main stairwell of the Museum and Art Gallery, Chamberlain Square, Birmingham. This is an unusual piece. The philanthropic brothers, whose wealth was derived from the manufacturer of heavy engineering machinery, seem to be eyeing each other rather fiercely against a background of beribboned evergreens. As Marion Speilman once said, this sculptor's work is strongly individualistic: "Mr Colton's work is never common" (147). The inscription reads: "IN GRATEFUL / COMMEMORATION / OF — THE GENEROUS AND PUBLIC-SPIRITED SERVICES TO OUR CITY OF SIR RICHARD AND GEORGE TANGYE TO WHOSE FORETHOUGHT AND MUNIFICENCE THE EXTENSION AND DEVELOPMENT OF THE BIRMINGHAM MUNICIPAL ART GALLERY AND SCHOOL OF ART ARE LARGELY DUE. Museum and Art Gallery, Birmingham. Spielmann, Marion Harry. British Sculpture and Sculptors of Today. London: Cassell, 1901. Internet Archive. Web. 21 August 2012.